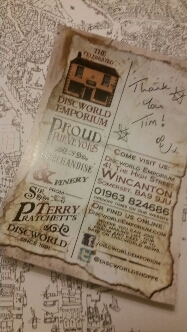 I’d seen The Discworld Emporium advertised in a few places, both around the wider ‘net and in Terry Pratchett fan groups and been tempted by a few of their offerings. I hadn’t ordered anything until earlier this month though, due to nothing quite leaping off the page until then. Then they released a colouring map of Ankh-Morpork, and Lady M and I both grinned in anticipation. Much of the appeal of the shop is that most of the memorabilia they sell can be seen as items stolen away from within that flat, magical world. There’s a whimsy to their offerings that appeals. Their good reputation in the groups also tipped the balance. I ordered the map, and then forgot all about it as life threw some extra curveballs and we got earnest about our decoration. Yesterday I dropped in to the post office to pick up an undelivered parcel. 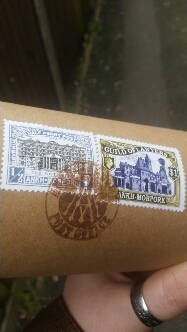 I had no idea what it was until I saw that it was a poster roll, and it had some decidedly Discworld elements to it: namely Ankh-Morpork Post Office Stamps and warning notices about snails, dribbling toads, and alchemist guild-made contents. Inside was a glorious map of The Big Wahoonie, and a personalised thank you/non-delivery note from the Ankh-Morpork Postal Service blaming “nae ordinary chicken!” which was why the non-magical Royal Mail had completed the delivery. The map itself is on large high quality, thick and creamy coloured paper and the printing is clear and unsmudged. Details of the city’s landmarks are easily made out, but without labels so that you can stretch your imagination recognising them from descriptions in the book. It’s little touches like this that mean I will be a return customer. I think I spent more time yesterday geeking out over the packaging than the actual contents, much to the amusement of colleagues and the staff at the local coffee shop. Now our only decisions remaining are whether we’ll colour it at all, or only certain elements, before or after we mount it on the wall. I’m tempted to order a spare so we can frame one untouched and play with the new one. This entry was posted in Geekery, household, idle musings, review, shopping and tagged Discworld, geekery, household, review, shopping. Bookmark the permalink.